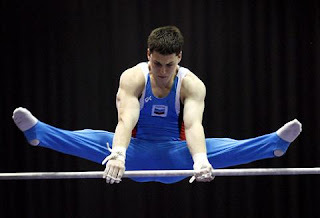 I previously wrote about men's gymnastics (link) in August right after the completion of the 2007 U.S. men's All-Around Championship. NBC finally aired their coverage of that event today. In the interim I had seen that my post was showing high on the list on Google for the individual athletes' names so I was interested to see how the searches would go today. As expected, shortly after the show started I started getting the hits and now I have compiled the results. Gymnast David Durante beat Guillermo Alvarez in this contest also, with 48% of searches wanting Durante and 40% wanting Alvarez. The noticeable difference between the two is that the majority of Durante searchers wanted him shirtless while the majority of Alvarez seekers wanted him gay, gay, gay. The remaining searches were for David Sender and Alexander Artemev. Today's coverage starts with some mention of the Hamm brothers. They're not my type - moving on. Next up is Alexander Artemev. His eyes are a little scary and I am a little concerned with that hump he's getting on his back. He needs to work on his posture. Then we get to Jonathan Horton. He's cute but he looks like he might be an unpleasant little fellow. He has an appreciable package, despite his tacky gray sweatpants. I won't say anything about Danell Leyva since he's underage (15). but I think in 3 years I will have a lot to say. His dad (who is also his coach) was a hoot with his reactions on the sidelines to his son's performance. He acts out all the moves and then goes ballistic with joy when the routine is over. Guillermo Alvarez had a beautiful vault. I love to see him smile when he knows he did well. Justin Spring had an amazing high bar routine. Unfortunately, he is one of those people who's natural hair color looks like a bad bleach job. I doubt his coach will advise him on this so I will: get some drabber. David Durante is tough and self-assured. He seems like the kind of guy you would want in a crisis. I would want him on the exit row on any flight. He can get the window out with ease but he's small enough not to get in the way when I crawl over him. Best Quote: "He likes it very, very tight ... Gymnasts often times, and you see it right there, he likes it, he likes it very tight." Tim Daggett speaking about Jonathan Horton. If you don't know, after this event the team was selected to represent the U.S. at the world championships in Stuttgart. The team was Durante, Alvarez, Artemev, Horton, Sean Golden, and Kevin Tan. The U.S. was 4th in the Team Final. Alvarez was 4th in the floor exercise. You can see from the photo that he wanted to show the judges all that he has to offer. Visa used their Niki Haris "Downtown" commercial again. I only saw the 60 second version of it once, and I like it better. I'm glad to see it is on YouTube.